Activision’s Skylanders started the whole Toys to Life genre back in the day, a fact that they keep reminding people about. Back then there were no competitors, but now, with both the excellent Disney Infinity 3.0 and the new LEGO Dimensions out, Activision really need to up their game and Superchargers is their answer. What’s new, then? Well not the storyline which sees the reoccurring foe, Kaos, try to use ‘the darkness’ (no, not that 90s rock band with the high pitched voice that sang about a thing called love) a force that he can use to pull Skylands apart and rule what’s left of the world. As usual it tasks you, as the Portal Master, with controlling the Skylanders in order to save the day and defeat the evil (and somewhat camp) Kaos from destroying Skylands forever. Where Superchargers differs is that in addition to the usual Skylander characters you now get to play around with vehicles, too. The starter pack comes with a single car, alongside 2 standard Skylander characters, and the physical toy looks excellent, the wheels move so it can be used as a proper toy and it resembles a day-glo Batmobile that’s just escaped from a lava pit. Place this on the new race-track themed portal and the car appears in the game, ready to zoom across the world. Actually, that’s not quite accurate. You see, it only appears in certain areas that are specially designed to act as race tracks or bonus areas, even if you keep it on the portal. Throughout the rest of the game you’ll be walking or running across the Skylands, fighting the evil minions of Kaos in the process. Business as usual, then but that’s no bad thing when the worlds are so well designed and the action is fun. Far from being negative, the restrictions of the vehicles to certain areas is a wise one and it’s just as well that the maps used for the main bulk of the game are better than ever, with some excellent visuals on the new consoles. As usual, your characters can be upgraded as they go, making it easier to progress through the more powerful enemies, though there is also a skill level setting at the beginning of the game for younger players to feel comfortable. When you do get into a vehicle, though, it’s great fun to use and really adds something different to the game. These are high speed areas where collecting items is all about timing a jump or avoiding obstacles. You can still use weapons to fire at obstacles or enemies but with the screen moving so fast, you won’t have much time to hang around. Combat is just as fun as it ever was and the NPCs in the game are given a little more character, too, making it far more of a fleshed out adventure this time around. 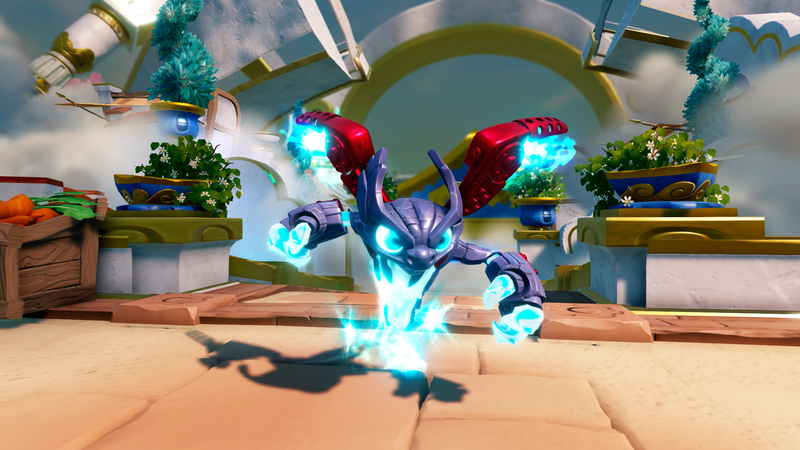 That said, there are still those annoying areas stuck behind a paywall where you’ll need a character with the right Skylander element to pass and as you only get 2 in the box, it’s clear that you’ll need to shell out for more toys to really get the most from the game. While Vehicle elements are very well thought out they, too, have the same issue with bonus stages needing one of the three vehicle types (land, sea or air) to open them. On the plus side, there is a new racing section where you can take your vehicles to the track to try and gain first place. It reminds me a little of the classic Diddy Kong Racing on the N64, no bad thing. A note on the toys themselves, here. They are the best designed characters yet, even though the materials used do seem a little cheaper. The vehicles feel like they were designed to be properly played with as toys, as well as in the game and they also look great. I would still love to see articulated toys in the range, mind you. 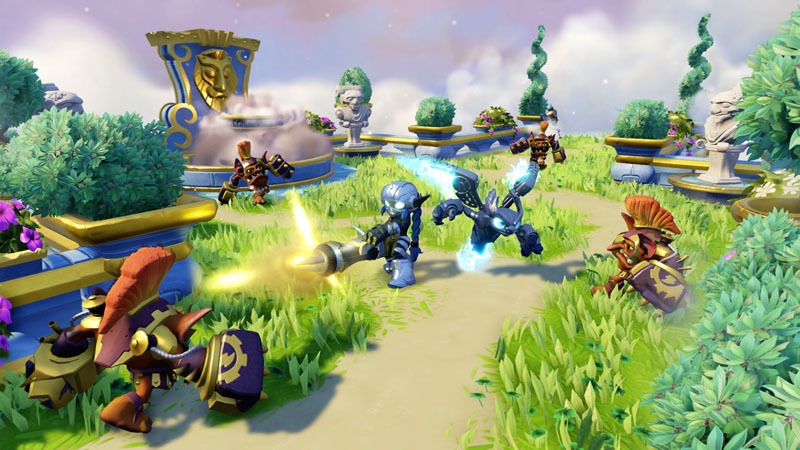 If you’re prepared to shell out on top of the initial starter pack, Skylanders Superchargers is the strongest outing yet for the franchise and the vehicles add a huge amount of fun to the game.